The Indian Society for Technical Education is a national, professional, non-profit making Society registered under the Societies Registration Act of 1860. First started in 1941 as the Association of Principals of Technical Institutions (APTI), it was converted into "Indian Society for Technical Education" in 1968 with a view to enlarge its activities to advance the cause of technological education.The major objective of the ISTE is to assist and contribute in the production and development of top quality professional engineers and technicians needed by the industries and other organisations. Being the only national organisation of educators in the field of Engineering and Technology, ISTE effectively contributes in various missions of the Union Government. The Ministry of Human Resource Development, CTE/DST/MIT/State Govts. are well associated with the ISTE for programmes relating to technical education. 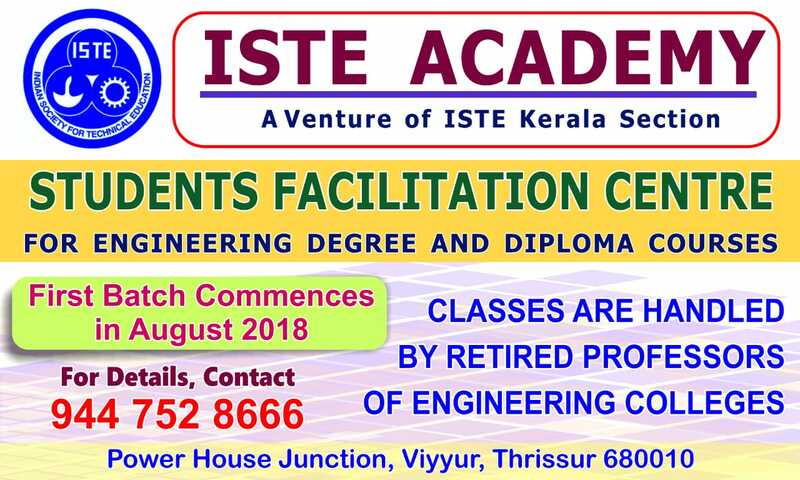 The headquarters of ISTE is at New Delhi and has sections in majority of the states and chapters in Engineering Colleges and Polytechnic colleges of the country. Welcome to the website of ISTE Kerala Section. The main goal of ISTE is to serve as a common agency for stimulating, guiding and empowering its members to own the responsibilities as facilitators of technical education for the service of mankind and the advancement of general welfare.